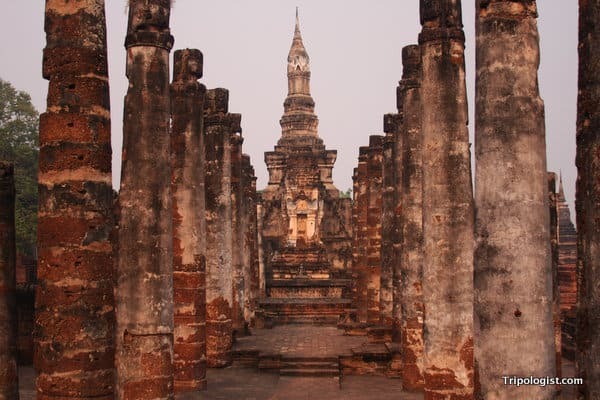 Before Bangkok and before Chiang Mai, there was Sukhothai. 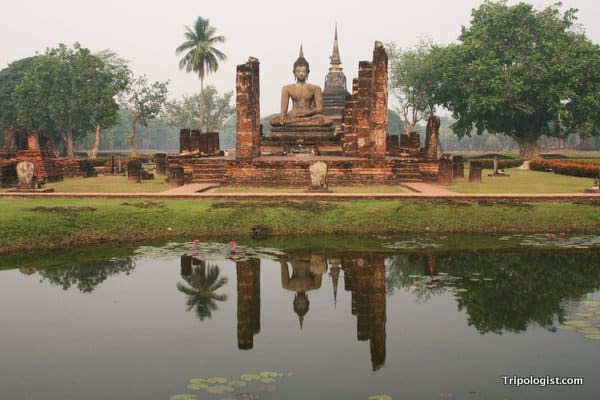 Often cited as the first capital of the Thai empire, Sukhothai is one of the most important ancient cities in all of Southeast Asia. Today, many visitors to Thailand make the mistake of skipping over Sukhothai on their way from Bangkok to Chiang Mai. Don’t make the same mistake. 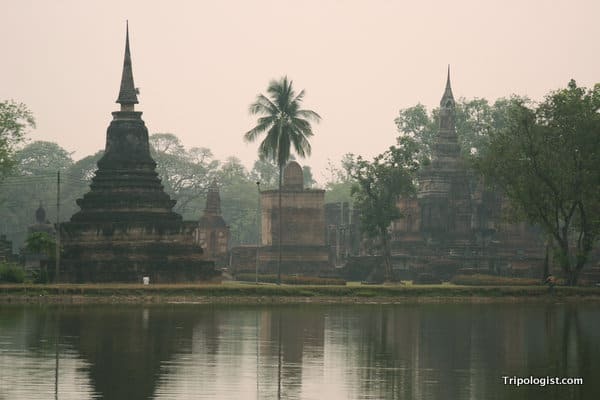 Sukhothai can be easily reached by bus from either city and can be comfortably seen in a full day of walking or biking. 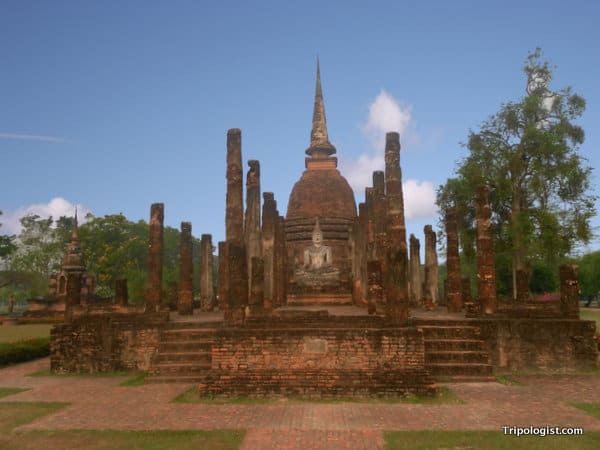 For me, the ruins of Sukhothai were one of the biggest surprises during my time in Southeast Asia. I never expected to see something so majestic outside of the Angkor ruins in Siem Reap, Cambodia. The reflection of Buddha at Wat Chana Songkhram. A series of ancient pillars leading to a chedi at Wat Mana That. A seated Buddha at Wat Mana That in the Sukhothai Historical Park. 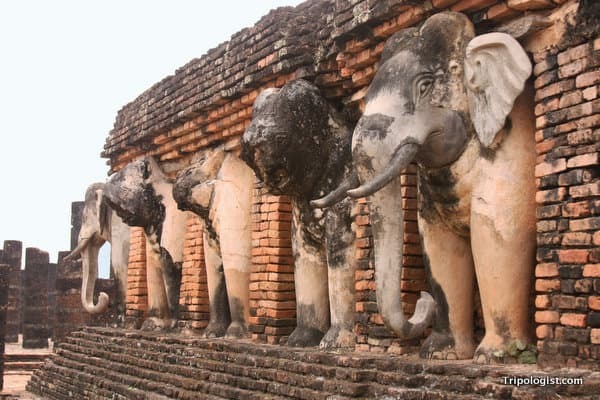 Well-preserved elephants holding up a chedi at Wat Chang Lom. 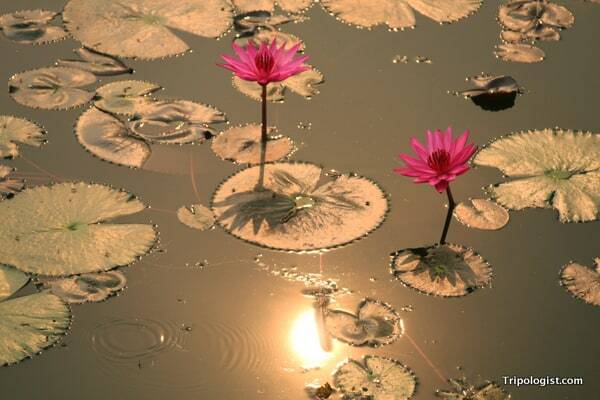 Beautiful lotus flowers in a pond at Wat Si Chum. The head of an impressive 15-meter tall seated Buddha at Wat Si Chum in Sukhothai. A seated Buddha perched amid a myriad of chedis at Wat Maha That in the Sukhothai Historical Park. 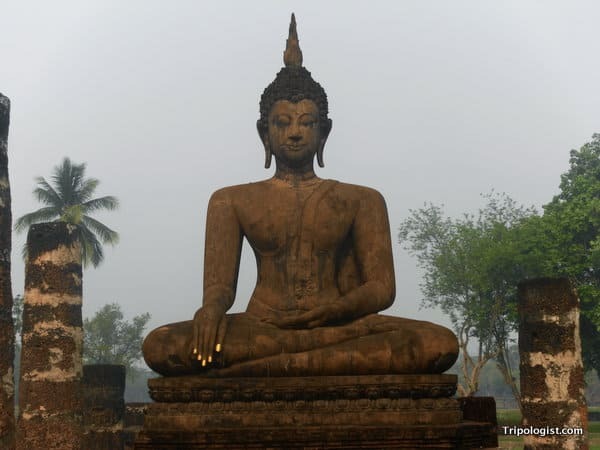 A Buddha statue sits in the middle of the ruins of Wat Sa Si in Sukhothai Historical Park. 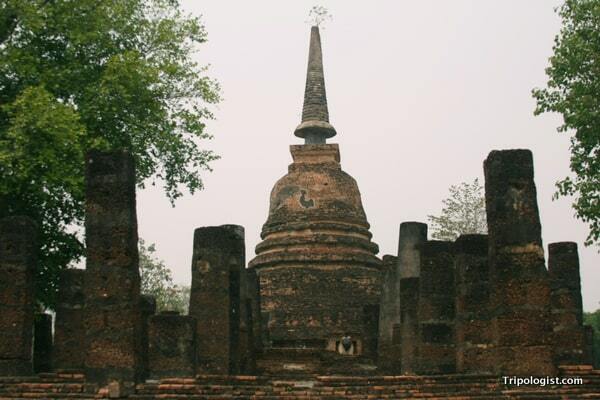 A large chedi at Wat Chang Lom, one of the many ruins of Sukhothai. Great photos! 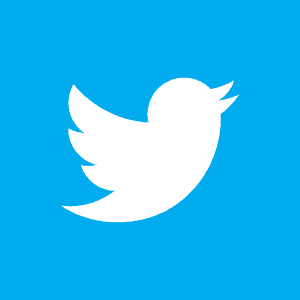 I loved this site. We biked around the whole thing and it ended up being one of my favorite travel days! Glad you liked the photos, Heather. Biking through Sukhothai was one of my favorite travel days as well. 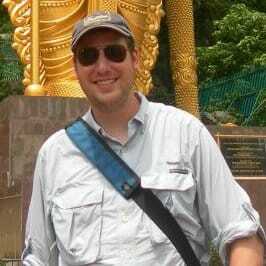 Good timing, we’re currentley in Chiang Mai and getting ready to head to Bangkok and might have a few extra days. We’ll have to see if we can squeeze this into the plan! Definitely try and get there; it’s well worth the 2-3 days out of your schedule. I’d recommend the ancient ruins of Sukhothai over Bangkok any day. I suggest when you have a trip in Sukhothai, then heading to Pitsanulok for sightseeing around (the corner). Meanwhile, you can take the train whether bus to Chiang Mai if you need coz, Pitsanulok is a hub of lower northern region of Thailand. Love Sukhothai. Definitely prefer it to Ayutthaya. 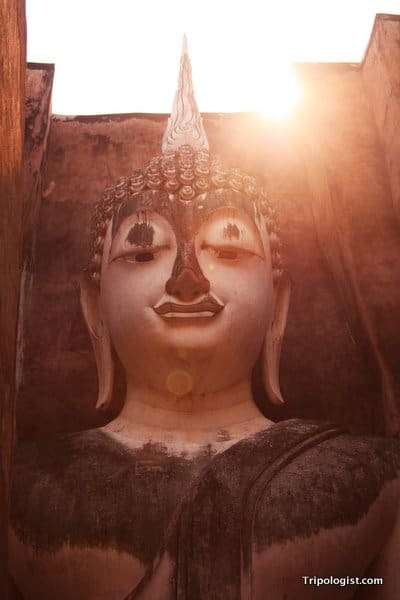 Ayutthaya is more accessible for most travellers since it’s such an easy day trip from Bangkok. But Sukhothai is a wonderful stopover between Bangkok and Chiang Mai. Didn’t have a chance to visit Ayutthaya when I was in Thailand, but I’ve heard many times that Sukhothai is much better. Thanks for the comment, James. 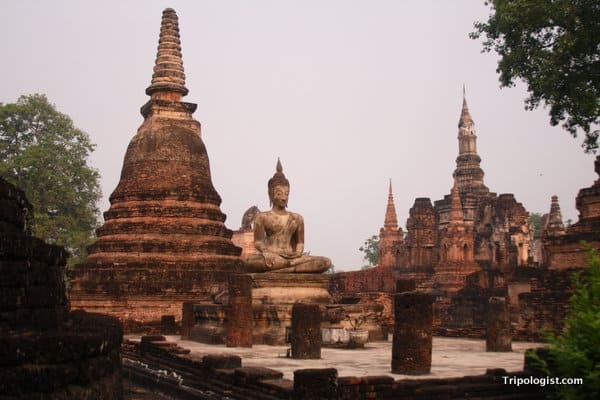 …and, speaking of the Empires time frame, Ayutthaya emerged after Sukhothai. We missed this place during our visit in Thailand. Gonna check this out along with Chiang Mai when we return.